It all started in Madrid with the Mercado San Miguel, it was an old fashioned typical neighbourhood market in the centre of Madrid then it closed down and re-opened in 2009 as a “Gastronomic” market with a huge variety of places from which you can buy food and drink to eat in a central area and it has become one of the top visitor attractions in the city. I loved the idea initially but think that the quality of the produce has gone down while the prices have risen. Also the locals no longer have a produce market nearby. It is frequently so packed that finding anywhere to put your food and drink can be almost impossible. 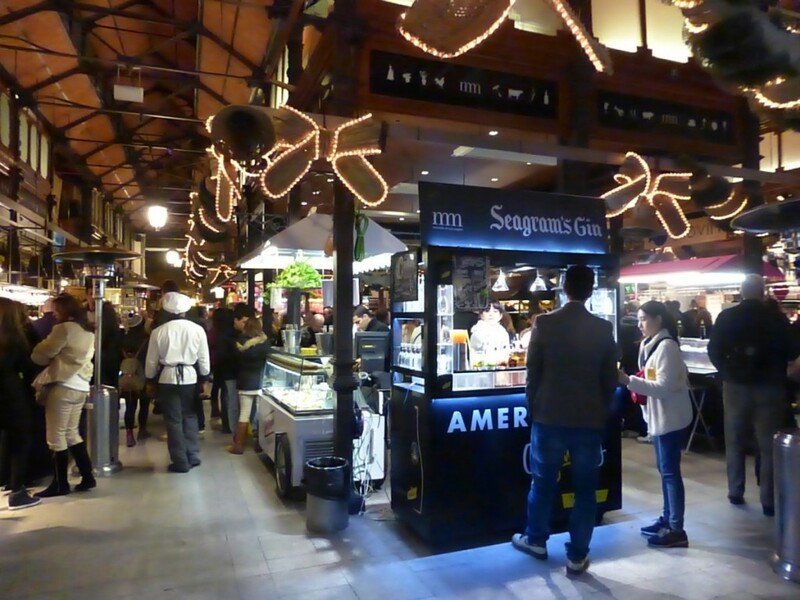 It is certainly worth a visit when in the city but having seen how this idea has flourished in other cities, mainly in Spain, I feel there are other and possibly better ways that local markets can be refurbished to cater for both local and visitor needs. Traditional markets are found in most local areas of Spanish cities and are an integral part of life, everyone goes to buy their meat, fish, fruit and vegetables, also perhaps get their shoes mended and maybe stop for coffee, wine and tapas or even lunch at the always present bar or bars in the building. San Miguel now has no such facility for locals who live nearby. 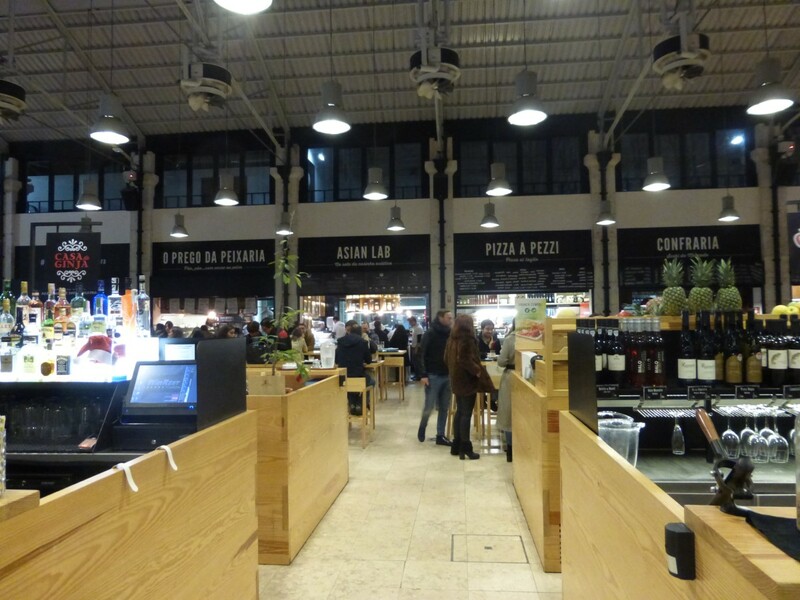 The Mercado San Anton in Chueca was the next in Madrid to have a make-over. However some stalls have been kept on the ground floor for buying produce, on the upmarket side it has to be said, and eating and drinking options have been introduced to the first floor and the lovely roof terrace. I enjoy it far more than San Miguel as the food is more reasonably priced and it is very popular but not too overcrowded. Other local markets in Madrid also seem to have changed slightly over the last five or so years for example Mercado de Anton Martin also in the centre of the city. It is still a traditional market but there are a number of newish small places where you can eat for example cold meats & cheeses with a good range of wines by the glass or sushi at a very popular Japanese place. It however still retains the old style bars for breakfast or lunch. 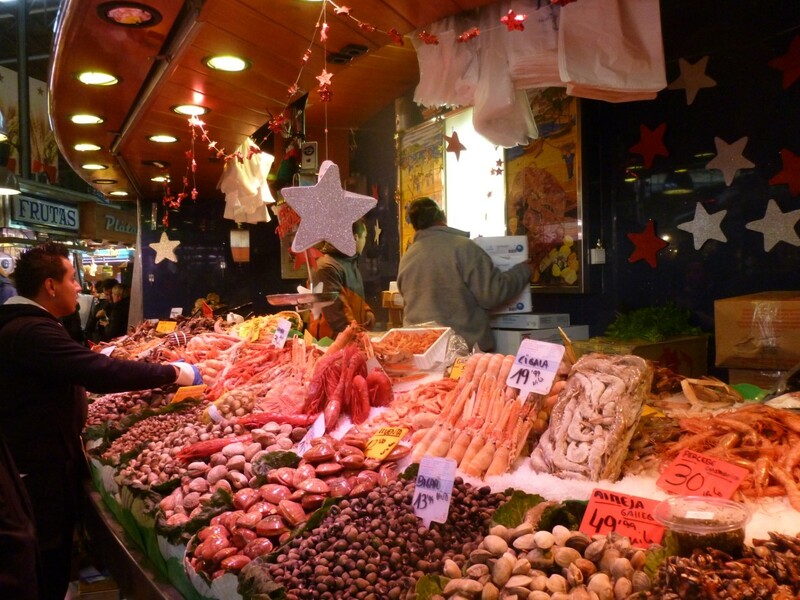 It is worth mentioning that one of the finest markets in the world La Boqueria in Barcelona is the subject of local controversy. 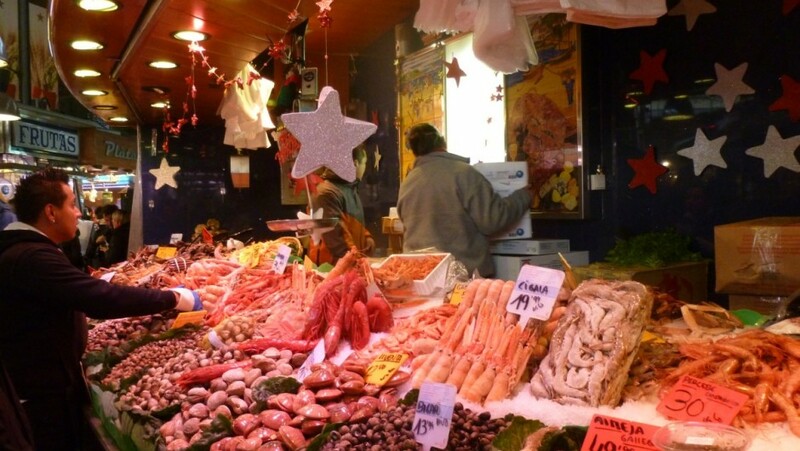 This is still a working market with an amazing range of produce and also many places to eat, some of which have been in any self respecting guide book for years but it is also one of the top visitor attractions. Locals frequently mention how it is impossible to shop there these days because of the number of visitors in the market. Now that is a difficult one to resolve, turn it into a San Miguel and loose most of the locals or try and restrict large tour parties. Various cities in Spain including Valencia and Cordoba have adopted a similar model to San Miguel and having visited both of those in the last year I feel they have not quite worked. Not having the produce areas perhaps means that the locals are less likely to visit and both are in locations where visitors are not as likely to visit as at San Miguel. Seville adopted the same model and a well known ex-bullfighter has transformed what was once the old fish market into the Mercado Lonja de Barranco. 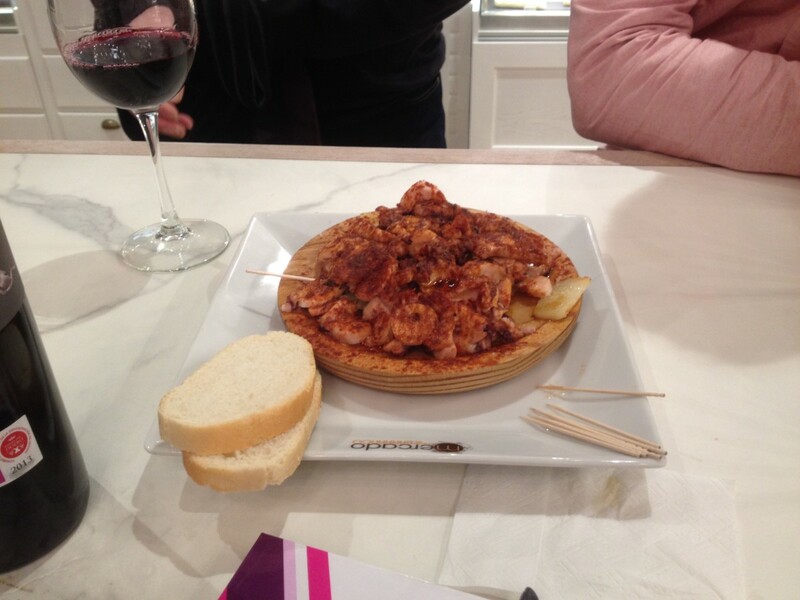 I visited with a local friend in December and we were both disappointed, it was expensive, service not great and such a shame that one stall selling pulpo, octopus, as it’s speciality did not have any white wine only red. We left and visited the Triana market just over the bridge, what a change, a real market with produce and stalls doing food and wine, one with one of the best ranges of G&T’s I have seen, a Spanish obsession ! 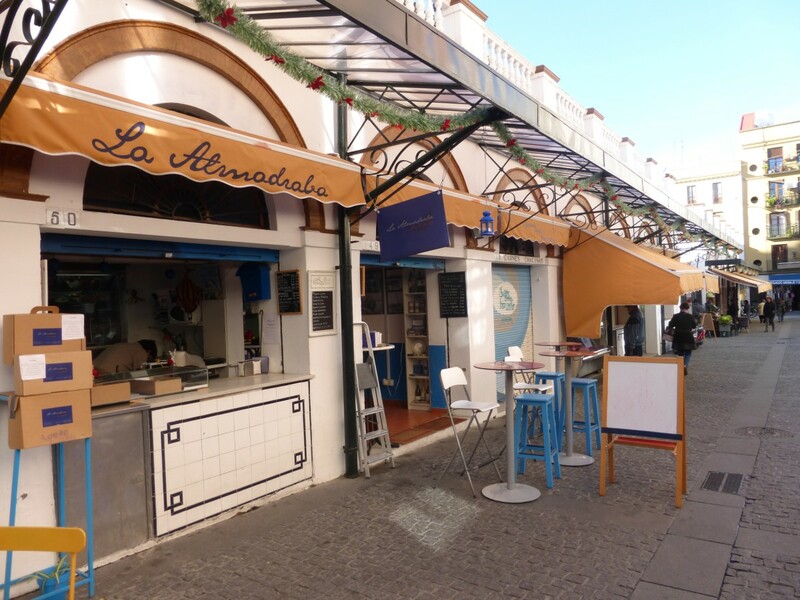 In Seville also well worth a visit is the Mercado Feria, the oldest market in the city, it has great produce stalls, including a good wine shop and also some good eating places especially La Cantina, with a lovely outdoor terrace, specialising in fish and seafood. Now this is the sort of market I would want in my area. I am saving my two favourite market transformations to last, both of these have retained the old produce markets but have added eating and drinking places and in both cases improved the market. Cadiz’s Central Market was a typical, traditional market with open air spaces around the central part. It was refurbished and re-designed a few years ago and retains all the traditional stalls in the centre while round the outside are food stalls with meat & cheese platters, seafood, empanadas from Argentina and dozens more options. There are a number of bars with wines, beer and soft drinks. In the open air part there are tall tables and chairs and benches where you can enjoy the food and drink. In the winter the eating part mainly seemed to be open during the day but I think in the warmer weather more places will be open in the evening. This is such a sympathetic refurbishment bringing the best of both traditional and new to the city. Leaving Spain and moving to Lisbon in Portugal the transformation of the Mercado de Ribeira has been outstanding. Long one of my favourite cities, the old market in a prime location was a bit of a sad place, a lovely building but with only a few produce stalls. The restaurant that was once there apparently had gone and something had to be done. 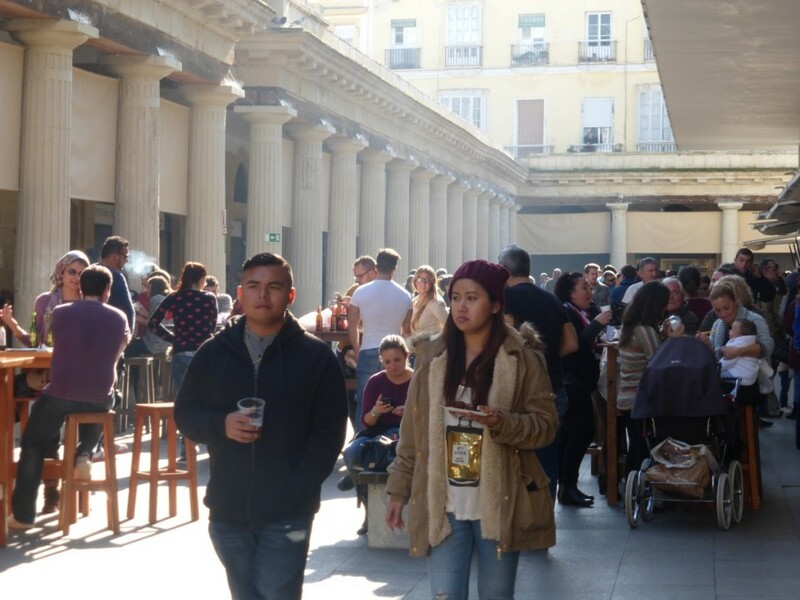 Along came Time Out and in 2014 the Time Out Mercado de Ribeira opened to great reports. I am delighted to say it does not disappoint, the produce section which was rather empty seems to have had a new lease of life. The food part has a mix of some of the top Lisbon chefs offering reasonably priced freshly cooked full dishes to smaller stalls offering a variety of “tapas” style dishes. The prices are in the main very reasonable and it seems popular with both visitors and locals. Hopefully new places trying to “revamp” old markets will learn from some of the more recent openings and not focus on trying to re-create San Miguel. Holland is following the trend of food markets with new examples opening up in Amsterdam and Rotterdam. We visited the new Foodhallen in Amsterdam recently and were very impressed. It is clear that the owners have looked at other examples and have taken the best aspects of these into the new venture. Located in the Oud West area of Amsterdam, a rapidly changing area, the market is in a converted tram depot and has been very well designed. There is plenty of seating areas, sadly lacking in many other markets, there is a wide variety of food and drink available and most seems to be reasonably priced. The building also has a restaurant and brasserie which both looked impressive. This is definitely a welcome addition to the dining options of Amsterdam.